Honeydew is another summer favorite fruit. 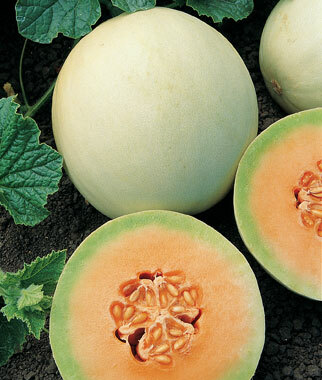 If you missed the prior articles about the watermelon and cantaloupe you can read about them here: Articles on Melons. It’s so disappointing when you get a melon that just doesn’t taste good. It may not be sweet enough or not ripe enough. It just makes the whole melon eating experience a let-down. That’s why we’re going to ask Mark a vendor at our local Farmer’s Market to show us how to pick out just the right honeydew melon so you can get the most flavorful, enjoyable melon possible. Squeeze the ends of the honeydew melon. You want them to have a little bit of a give to it, as that means it’s ripe. Look at the color of the outside of the honeydew melon, the more yellow it is, the better. Look for a golden hue to it. The skin will have almost a sticky texture when it’s at its ripest. Brown spots on the rind of a honeydew melon are kind of like brown spots on a banana. That’s where the fruit is the sweetest. So don’t shy away from a few brown spots. Use all of your senses when checking your honeydew melon. Give it a smell. If it has a nice, pleasant aroma, then it’s going to taste good too. Mark grabbed a honeydew melon up to his ear and started shaking it side to side. He said, “If you can hear the seeds rolling around in there, then it’s ripe.” I tried it, but couldn’t hear the seeds. He said that one takes practice. Tapping on the melon with your knuckle and hearing a hollow sound, means the melon is ripe. I asked Mark about honeydews that are orange inside? Make also said that if f a honeydew melon is picked too soon, that is, before it turns yellow, it will never ripen. He also said it’s best to avoid buying melons past August, because you probably aren’t going to get a very tasty melon unless you live in California where they are grown. Mark pointed out that the most important thing when choosing just the right honeydew melon is to pay attention to the color of the rind. A honeydew melon starts out green. If it remains green or even has a greenish hue to it, then it’s not at all ready yet. Watch out for green spots too. This means it’s not ripe yet either. And it’s not going to get that way with time like bananas will. Honeydews don’t keep ripening after their picked. Honeydew melon is really a melon you have to buy to eat right away. It doesn’t get better if you buy it early and let it sit in the sun. You also want to store it at room temperature. However, after it has been cut into you will need to store it in an air-tight container in the refrigerator. This will help keep it fresh for up to two weeks. Now go out and pick your perfect honeydew melon and then enjoy all of its sweet, watery goodness. 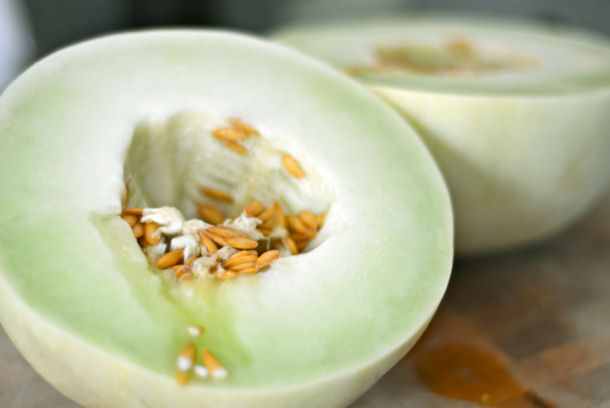 You’ll never pick a disappointing melon again, thanks to the tips Mark shared with us on how to choose the best honeydew melon. This entry was posted in Guest Speaker, Reviews - Kitchen Utensils - Cooking - Food and tagged August, California, Cantaloupe, Fruit, Home, honeydew, honeydew melon, List of melons, Melon, Ripeness in viticulture, Watermelon. Bookmark the permalink.